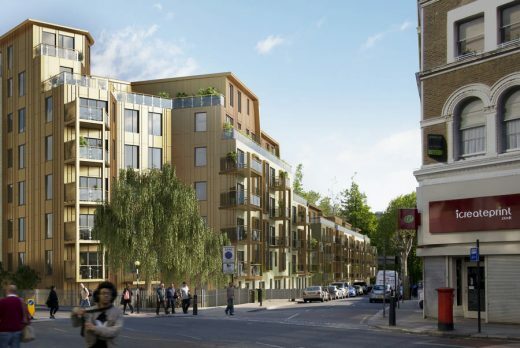 26 November 2013 – BDP has secured detail planning consent for its competition winning housing and regeneration project at Tollgate Gardens in Maida Vale, London. The redevelopment of the 1960s estate forms the first step in Westminster City Council’s ambitious Housing Renewal Strategy. 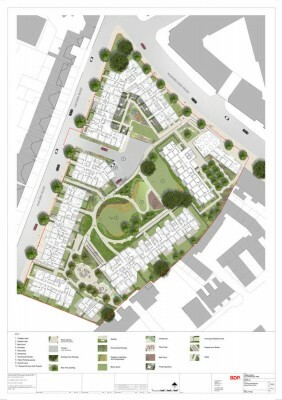 The BDP design was selected by the Residents’ Panel in September 2012 following presentations of the three final schemes by Maccreanor Lavington, Glen Howells and BDP. The design will transform the existing estate by creating a series of streetside terraces set around a new communal garden space, akin to the urban plan of the Church Commissioners’ Edwardian Estate. The new terraces accommodate 195 new homes, with 53 refurbished homes in the retained Tollgate House, the highest existing building. The new residential community will include affordable housing. The urban design plan shapes the residential terraces to enjoy street activities to one side, and south facing communal gardens to the other. The existing ground levels are used to accommodate car parking with the garden forming an oversailing green plateau above. The terraces range in height from two storey to nine storeys, building up from south to north to accentuate sun angles and views, reaching a high point at the corner of Maida Vale and Kilburn High Road adjacent to the 11 storey 1960s building. The planning permission follows a 12 month sequence of design workshops and meetings with existing residents, who will have the opportunity to live in the new community once complete in late 2016. Cllr Daniel Astaire, Westminster City Council cabinet member for business and housing, said: “Tollgate Gardens is a great example to show that residents working with architects to design their own neighbourhood really works. Westminster is undergoing one of the largest housing regeneration projects in the country at the moment, and this is a vital first step on that path to success.